Now, using an iPhone, iPad, Mac or Android on stage for set lists and sheet music just got a lot easier! iRig BlueTurn is a Bluetooth page turner with silent backlit pad buttons that easily lets you turn pages and scroll through material hands-free. 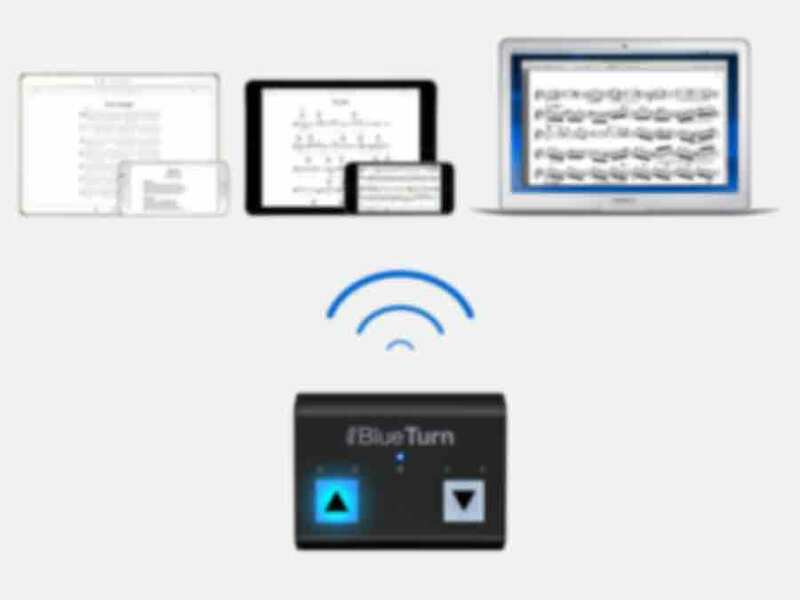 If you’d like to streamline the page turning process for your sheet music, lyrics, slides, tabs and other documents, iRig BlueTurn is the answer. iRig BlueTurn is a compact Bluetooth page turning solution for iPhone/iPad, Mac and Android that lets you use your feet to set your hands free while performing. It comes with two highly visible silent backlit pad buttons that you can trigger with your feet to turn pages, leaf through lyrics, scroll slides and more in your favorite apps and software. Now, with iRig BlueTurn, you'll be ready to perform at your best no matter whether you're conducting an orchestra, playing music from a score, shredding through some guitar or bass tabs, giving a major presentation, lecturing, or making a speech. With iRig BlueTurn, it's your turn. iRig BlueTurn lets you take control from the floor with ease. 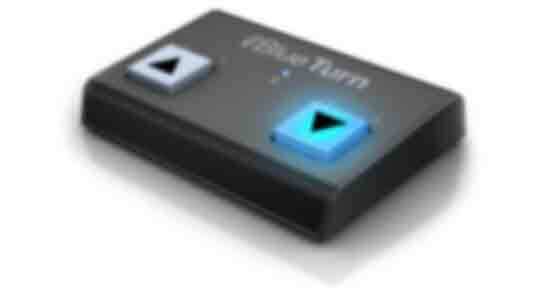 Its two noiseless buttons send HID messages to a synced device via Bluetooth LE technology. Just pair iRig BlueTurn with your device or computer, fire up a compatible app — iRig BlueTurn works with all of the popular page turning and document viewing apps and software including IK's own iKlip Stage — and you'll be ready to go. 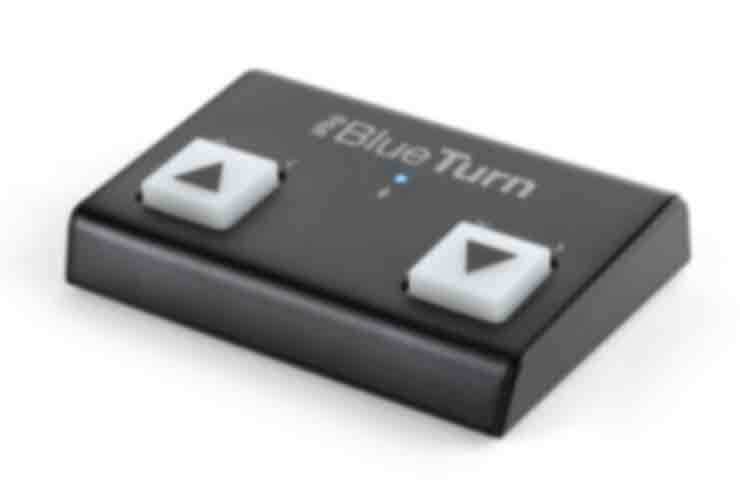 iRig BlueTurn's buttons can be used in three different configurations: They can send Page Up/Page Down, Arrow Up/Arrow Down or Arrow Left/Arrow Right commands depending on what you want to do. These different modes can all be chosen directly from the hardware when powering up. Let's face it: you're not always going to be performing in areas with a lot of light. In fact, if you're presenting a digital slideshow, performing music on stage or giving a lecture, there's a good chance the space around you will be pretty dark. That's where iRig BlueTurn comes in. Its buttons have backlighting, which means that you'll be able to see and use it no matter how much (or little) ambient light is around you. Plus, the buttons make absolutely no noise when pushed making iRig BlueTurn perfect for symphonic performance where dynamics are the centerpiece of the composition. iRig BlueTurn is as mobile as you are. Small in size and road-ready, iRig BlueTurn is an ideal travel companion. It features a rugged and durable enclosure that's small enough to easily fit into a small bag or backpack. It runs on 2 AAA batteries that last a long time thanks to its ultra-low energy consumption. Because it communicates wirelessly with your mobile device, iRig BlueTurn leaves all of your device’s connection ports open — it’s perfect for use with any connected interface or accessories. 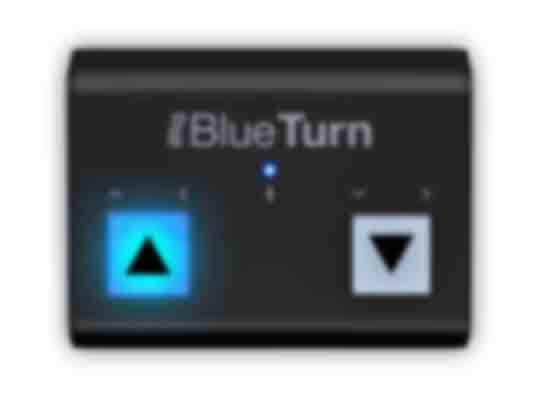 iRig BlueTurn can be used with an iPhone, iPod touch, iPad, Mac or any Android device with OS 4.3 and above that supports Bluetooth LE. 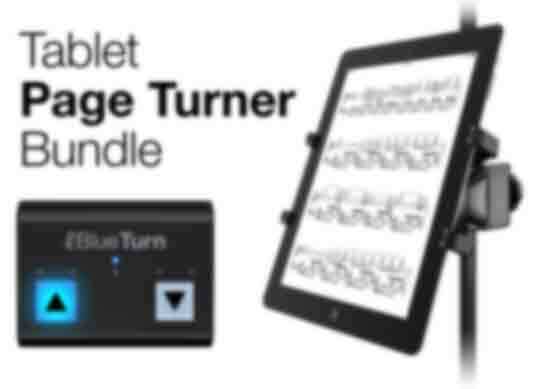 iRig BlueTurn is the perfect stage companion for your tablet, so we created a special bundle called the Tablet Page Turner Bundle that combines the iRig BlueTurn with iKlip Xpand for a full stage-ready set list management and page turning system for one low price. iKlip Xpand is the versatile microphone stand mount that easily secures your iPad or Android tablet to your mic stand for stage use. iRig®, iRig® BlueTurn are trademarks or registered trademarks property of IK Multimedia Production Srl. All other product names and images, trademarks and artists names are the property of their respective owners, which are in no way associated or affiliated with IK Multimedia. iPhone, iPod touch, iPad, Mac and the Mac logo are trademarks of Apple Computer, Inc., registered in the U.S. and other countries. Android™ is a trademark of Google Inc.